It's been 12 years since President George W. Bush declared that "America is addicted to oil" in his State of the Union address. We still are, but thanks mainly to technology disruption in the oil patch, we are now within striking distance of eliminating our reliance on imported oil. OPEC, by imposing oil production caps at a time when Venezuela's output is in rapid decline, has handed the U.S. shale industry an opportunity to earn large profits while capturing almost all of the world's oil demand growth for 2018. That opportunity will not go to waste. During the price slump that began late 2014, the shale industry pre-drilled some 5,000 wells in anticipation of better times. Those wells are now getting fracked at a record pace, leading to a production surge that is causing jaws to drop around the world. Three major milestones will be reached in 2018 alone. The U.S. will produce more oil than ever before. U.S. oil output will exceed that of Saudi Arabia. And production from the Permian Basin will triple (from seven years ago) to 3 million barrels per day (all while breakeven prices on new wells remain below $50 a barrel). Attaining full U.S. energy independence will likely take another 2-3 years, as the chart on the following page illustrates. And on that front, it's not just about pumping more oil out of the ground, it's also about shedding the addiction. Tesla's Model 3 is poised to become a top-selling passenger vehicle. And the Tesla Semi could become a popular favorite among trucking firms – who are struggling with emission-related engine shut-down problems in their big-rig fleets. Also, Hawaii's grid operators, which collectively consume a million barrels of diesel per day keeping their electrical grids up and running, now have aggressive programs to go 100% renewable ahead of the state's 2045 mandate. 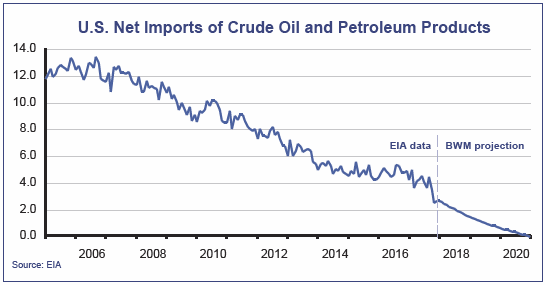 We estimate these oil-demand reductions could collectively reduce domestic demand by around 35,000 barrels a day – not a lot, but enough to push U.S. net imports of crude oil and petroleum products down to zero by 2020. Bigger oil demand reductions could occur as electric self-driving taxi and transportation services proliferate between 2020 and 2025, potentially driving per mile costs down by a factor of 10. As internal combustion vehicles are increasingly priced out of the market, the average number of miles they are driven each year will plunge, taking oil demand down at a faster pace. It's conceivable that excess global oil supply could reach 3 million barrels per day in 2025. The shale producers have become the "high-frequency producers" of the global oil industry. They can bring new oil supplies to market in just months. And when they cut back sharply on new production, the high depletion rates of recently fracked wells causes output to fall just as quickly. In effect, the shale operators are the new market-makers, and OPEC is finding it increasingly difficult to control the price of oil. Going forward, expect crude to be firmly anchored around $50 a barrel (just above the breakeven cost of bringing new shale oil to market). This is likely the beginning of a new era of oil price stability. Instead of hunting for oil, the shale industry has figured out how to farm it, using little more than drilling rigs, water and sand (the output level of a given well is engineered based on shale characteristics and fracking intervals).So, as shale producers gain global market share at the expense of OPEC and other politically unstable producers, odds are that oil price volatility will become increasingly muted. Because most inflationary surges and mortgage default situations have been catalyzed by a spike in oil prices (this includes the Financial Crisis of 2008), recessions could become rare in a world without big oil-price swings. The business cycle itself might largely disappear, because the Fed would no longer be called upon to mitigate the inflationary effects of oil price swings. Market timing, which has always been difficult, might become all but impossible. And sector rotation could be rendered ineffective, ending up like the January effect or the Dogs of the Dow. As for the energy sector, there's little question that 2018 will be a banner year for the shale industry. But unlike the past, where a handful of global energy players with deep pockets earned outsized profits by controlling exploration and development, today's shale industry more closely resembles food production – an industry with thousands of producers in which only the most efficient operators survive and prosper. That being the case, earnings in the energy sector seem unlikely to make a full recovery to the level of years past. And starting in 2025, there is a growing risk that demand may enter an era of permanent decline. It might take 50 years for oil to be fully displaced, but energy stocks could be impacted if demand growth suddenly disappears. Stocks went on a roller-coaster ride during the first quarter. Early on, valuations surged as analysts factored in the positive impact of tax reform on corporate earnings. Then wage inflation spiked in February – most likely because of a surge of one-time wage increases right after tax reform was enacted. As fears of a hawkish Fed grew, interest rates rose and highly-leveraged investors involved in a popular bet on market tranquility began to see large losses. The resulting “volatility panic” took several days to run its course, wiping out some 90% of its participants' capital. For the rest of us who weren't involved in the overly-popular high-risk trading strategies, it was more or less a routine correction. Initial recovery came quickly, and was helped along by comments from the new Fed Chairman (Jerome Powell), who said there were no decisive signs of wage inflation yet. However, the relief-rally was short-lived. Following its March meeting, the Fed signaled that rates would continue to rise in 2019, leading to a monetary policy that could become restrictive in 2020. Then a short time later, the market reacted sharply to Trump's proposed tariffs on Chinese imports, this time with technology stocks leading the market lower. Throughout all the ups and downs, evidence continued to mount showing that corporate tax reform was helping the economy. Businesses showed a renewed willingness to spend, and unemployment remained low and stable even as hiring expanded along with the workforce. But that was not enough to overcome investors' renewed fears. The S&P 500 finished with a decline of 0.8% for the quarter. Bonds did worse, with the Barclay's U.S. Bond Index pulling back 1.5%. Our stock-oriented portfolios finished ahead of the S&P, thanks to a continued emphasis on the technology sector. On the bond side, we limited losses by focusing on shorter-term securities and the high-yield sector, which in most cases made for a smaller decline than the Barclay's Index. It's possible that both the Fed and the bond market have over-reacted to signs of strength in the economy. While inflation is ticking up, it seems unlikely that it will follow the patterns of the past in today's tech-disrupted world. Energy prices are being held in check by surging U.S. oil production. Core PCE inflation among goods is still in negative territory, much like it's been since the 1990s. And we're just beginning to see the impact of cloud-based services, which are starting to exert downward pricing pressure on the service sector (which has been hovering around 2% inflation since 2012). Finally, even though direct labor shortages are becoming a bigger problem, wage inflation is likely be held in check by low productivity growth, which limits the amount of money employers have available for annual salary increases. The potential for a global trade war appears to be the biggest risk facing stocks at the moment. But any return to an era of punitive tariffs may not be as damaging as some stock investors believe. Most publicly-traded companies operate in multiple countries, and should be able to successfully navigate any escalation in tariffs or trade barriers. Technology makes it relatively easy to set up shop wherever consumer demand exists, or to move operations to countries where trade barriers are less onerous. Additionally, the U.S. economy (which currently runs a large trade deficit) may not have as much to lose relative to countries running big trade surpluses (which are more dependent on exports). Finally, a large majority of the high-value components and capital goods that we export (and the outsized market capitalization represented by those exports) has little substantial competition, suggesting that any country slapping large tariffs on U.S. goods will run the risk of doing more damage to their own economy than to ours. As such, we are making some modest portfolio changes, such as favoring lower-volatility stock funds and shifting our small weighting in foreign stocks more toward Asian technology disruptor companies. On the bond side, we’ve modestly boosted yields by moving further out on the yield curve, by increasing exposure to Corporate Bond Fund. Unless there are signs that global trade tensions are moving beyond a war of words, we don't think it will be necessary to take defensive measures.